This month I had the amazing experience of a behind-the-scenes look of a Cambodian wildlife rescue center with the help of Wildlife Alliance, a local nonprofit dedicated to protecting forests and wildlife with a focus on rehabilitation and release. They work with the Phnom Tamao Wildlife Rescue Center, which is just south of Phnom Penh. I, along with my gorgeous-inside-and-out travel partner Joelle, had the opportunity to support the conservation work by taking a day tour to meet animals rescued from the wildlife trade. What I appreciated from the start of our experience at Phnom Tamao was an explanation of how to identify if a ‘rescue center’ is actually abusing their animals. 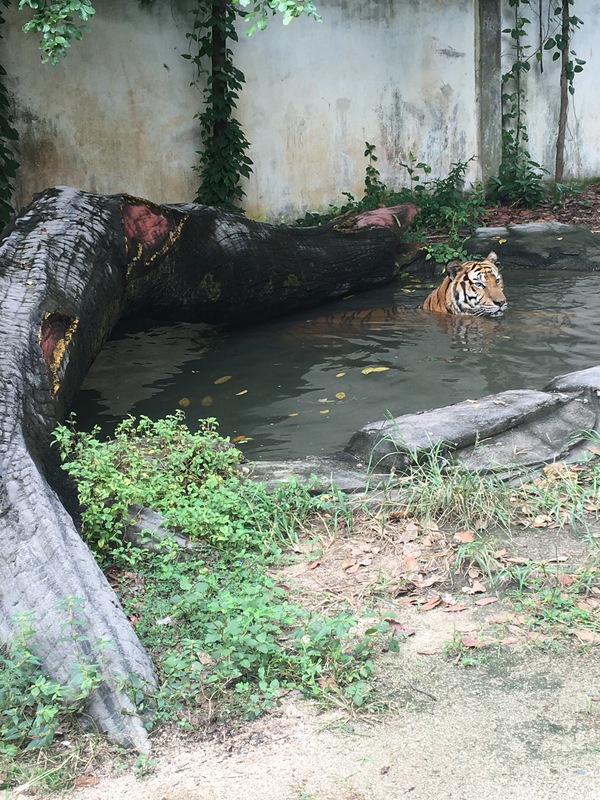 While it was sometimes sad to see animals in enclosures at Phnom Tamao, it was reassuring to know that the primary focus of their work is on release – as opposed to places that train/abuse animals with bull hooks, drugs, and sleep deprivation so a tourist can take a picture with a lion, or ride an elephant. There’s a lot of literature on reputable sanctuaries, so if you’re interested in visiting, do the research. — Meeting tigers (interbred cross between an Indochinese tiger and a Bengal, which is sad because these guys have a lot of back and hip pain from the improper genetic mix). — Meeting tigers who peed on me. Pro tip: when the tail goes up, MOVE. –Meeting Chhouk, a baby elephant who lost his leg on a snare (our guide believes he got caught, struggled and self-amputated his leg in order to return to his family). Eventually, his herd made the difficult decision to abandon him, which is when Wildlife Alliance were called to relocate him to Phnom Tamao. We watched as he did ‘tricks’ for us, meaning standing in the proper position for health checks to change his prosthetic leg. Chhouk made himself a little pina colada after (alternating bites of pineapple and coconut) which was completely adorable. The bottom of the prosthetic is made of a car tire! — Meeting my DREAM MONEKY, a gibbon. This poor girl was caught in the pet trade, and has adapted too many human behaviors to be released into the wild. Examples: making steady eye contact, and completely freaking out when she sees another monkey. I started thinking about the parallels between myself and these rescued animals. It’s not infrequently that we are asked the question “What will you do after Remote Year?” — and the fact that we’ve spent the past month with another RY group who is on Month 11 has brought this question to the forefront of my mind. Am I spending this year on a sort of mental/emotional rehabilitation? Nurtured by my experiences and friendships abroad? Am I meant to be released back into Corporate America/the wild/my natural habitat? Am I taking this analogy too far? The beauty of changing cities every month is that I really can’t dwell too much on future plans. My immediate future includes moving to Kuala Lumpur and finding more work projects, and that’s about as much as my poor brain can handle these days. So do me a favor and check back in with me … oh I don’t know, maybe three days before the end of RY. Hopefully by then I’ll have a plan. If you’re interested in learning more about Wildlife Alliance or to a sponsor an animal, check out http://www.wildlifealliance.org. **Special thanks to Joelle for this amazingly unique and unforgettable birthday gift. I’ll never forget it for all my days.